The Centre for Studies of the Culture and History of East European Jews in Kiev has organized an art exhibition of the work of Ukrainian-Jewish avant-garde artist Mark Epstein (1899-1949). The exhibition, Mark Epstein: Return of Master opened at the National Arts Museum in Kiev in mid-December and includes about 100 works and is on view until the end of this month. The exhibition is the first of Epstein's work, which was not exhibited during his lifeitme during the Societ period. In conjunction with the exhibition the Centre has published an album of about 60 Epstein works including graphics, paintings, scenographic works an sculpture. 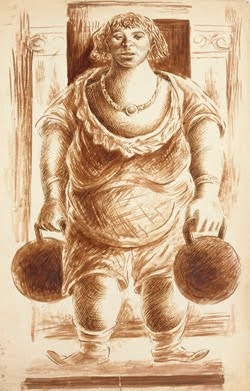 Mark Epstein was a notable figure in the artistic life of Kyiv during the 1920’s. In 1928, having just finished the Kyiv Arts College, he immersed himself into the progressive arts movement of that time. He attended O. Exter’s art studio where his newest creative ideas were polished. Mark Epstein’s cubic-futurist works of the beginning of the 1920’s – Violoncellist, Family, Tailor, The Two, A Woman with a Yoke – have become part of the history of modern Ukrainian art. Epstein was one of the founders of the artistic section of the Culture League – an association whose aim was the development of Jewish culture. Members of the section also included O.Tishler, El Lysytsky, J. Chaikov, S. Nikritin, and others. Marc Chagall, N. Altman, R. Falk, and D. Sterenberg also cooperated with the Culture League. In their effort to create new Jewish art, members of the Culture League synthesized images of traditional art with Ukrainian avant-garde ideas. Epstein took an active part in this work. Unfortunately, only the graphic works of Epstein have been preserved from the 1920’s; representations of his sculptures have survived only as photos, while his paintings have been totally lost. The work of the Culture League was terminated in the middle of the 1920’s. In 1932, Epstein had to move to Moscow. He took practically no part in exhibitions there, but worked a great deal. However his attempts to adjust his talent to the requirements of the times bore no evident fruit. Here is a small selection (compliments of Flickr) of Epstein's innovative graphic designs using new forms of Hebrew lettering and composition. Cover of the magazine "Freyd" (Joy). Kiev, Kultur-Lige, 1923, No 8, Yiddish. 27,1 x 21,5. Design: Mark Epstein Location: Musée d'art et d'histoire du Judaisme, ParisSource: Hillel (Gregory) Kazovsky, The Artists of the Kultur-Lige, Jerusalem; Moskau 2003. Location: Musée d'art et d'histoire du Judaisme, ParisSource: Hillel (Gregory) Kazovsky, The Artists of the Kultur-Lige, Jerusalem; Moskau 2003. Cover of a "Theather-bukh" (Book on the Theater). Kiev, Kultur-Lige, 1927, Yiddish. 23.5 x 16,5. Design: Mark Epstein Location: Musée d'art et d'histoire du Judaisme, ParisSource: Hillel (Gregory) Kazovsky, The Artists of the Kultur-Lige, Jerusalem; Moskau 2003. 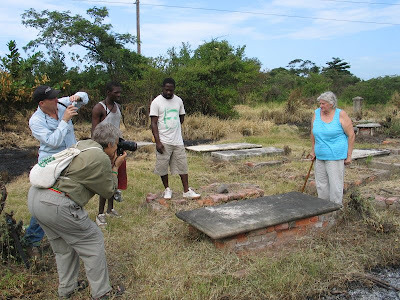 ISJM Vice-President and architect Rachel Frankel has written a short piece about the Jewish cemeteries of Jamaica for the website of the Martin Marty Center for the Advanced Study of Religion at the University of Chicago Divinity School. This derives from her paper at last January's conference on Jewish Diaspora in the Caribbean Conference, the proceedings of which will soon be published. Rachel will be leading a small team back to Jamaica this spring to continue cemetery documentation. At the outskirts of Port Royal lies Hunt’s Bay Jewish Cemetery, Jamaica’s oldest burial ground no longer in use today. The cemetery has recently been inventoried and mapped, and is now a Jamaica National Heritage Trust Site. Inventory work continues this month on the Orange Street Jewish Cemetery, Jamaica’s two hundred year old bet haim (“house of life”). Jamaica’s several Jewish cemeteries, which ring this Caribbean island, are not wholly preserved, accessible, or undisturbed, but they contain over three continuous centuries of gravestone imagery, epitaphic language, genealogy, burial patterns, and cemetery site design. Thanks in part to the United Congregation of Israelites Shaare Shalom Synagogue of Jamaica and Caribbean Volunteer Expeditions, these New World necropolises are undergoing inventory, analysis, and preservation. 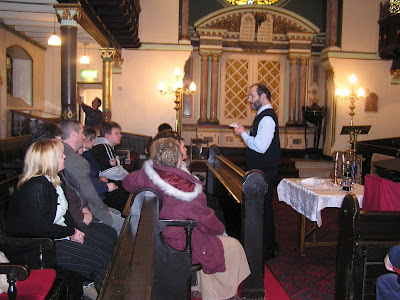 In November 2010 the Foundation for the Preservation of Jewish Heritage in Poland released the English language version of the booklet 'Chassidic Route. Lancut', part of the organization's ongoing series of publications documenting the properties under its care, and the histories associated with those places. Together these sites have been linked as the Chassidic Route project, though often the Jewish history of specific places predates the rise and success of Hasidism, and includes non-Hasidic 18th-20th century components. Many of these places still have imposing remains of central synagogues - usually used by the entire community. The smaller shtibls and shuls where often the daily activity of Hasidic religious communities took place are long gone. So far the Foundation has published brochures about Chelm, Jaroslaw, Krasnik, Lesko, Lezajsk, Ropczyce, Rymanow, Sanok, Ustrzyki Dolne and Zamosc. They are all available in Polish and in English in online versions and hard print copies. Online versions can be downloaded from the "About Us" and "Heritage" sections, and can also be found at POLIN - Polish Jews Heritage web portal at www.polin.org.pl. 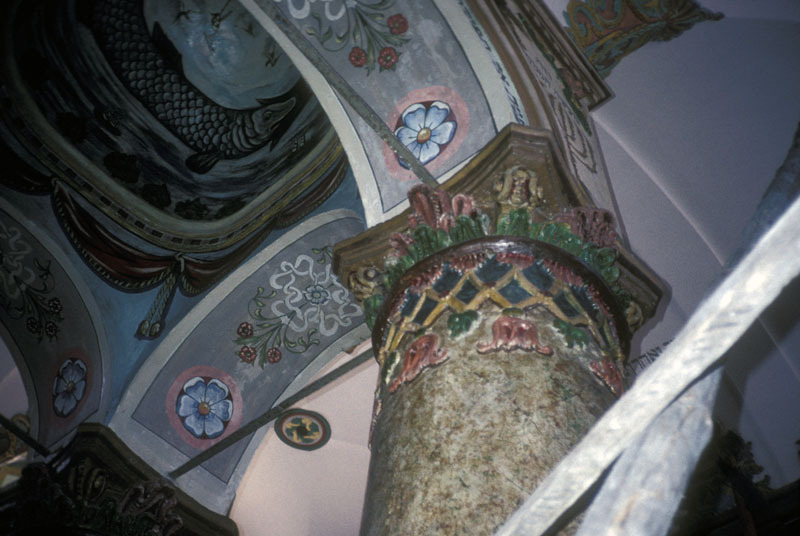 Lancut is one of the most impressive remaining Polish synagogues and it is also one of the best preserved, having successfully survived demolition attempts by both Nazis and Communists. The survival of the building is due to the foresight and courage of just a few individuals. The interior is remarkable for its fine central bimah (of the bimah-support" type), its womens' gallery above the entrance and opposite the Ark wall, and its exceptional and much discussed symbolic painted wall decoration. After the fall of Communism restoration and care for the building became more popular. I first visited the synagogue in 1990, and I post some previously unpublished photos of the restoration of the building underway at that time. Like many important Jewish sites the synagogue was recognized as an architectural and artistic site of historic significance in the late 19th century, and was first restored in 1896 and again in 1909-10. During German occupation of Poland, the Germans attempted to set the synagogue on fire. The thick masonry wall survived, but the wooden women’s gallery, window frames and interior furnishings were destroyed. The fire was put out following the intercession of the local noble Alfred Antoni Potocki, who made an appeal to the German authorities. 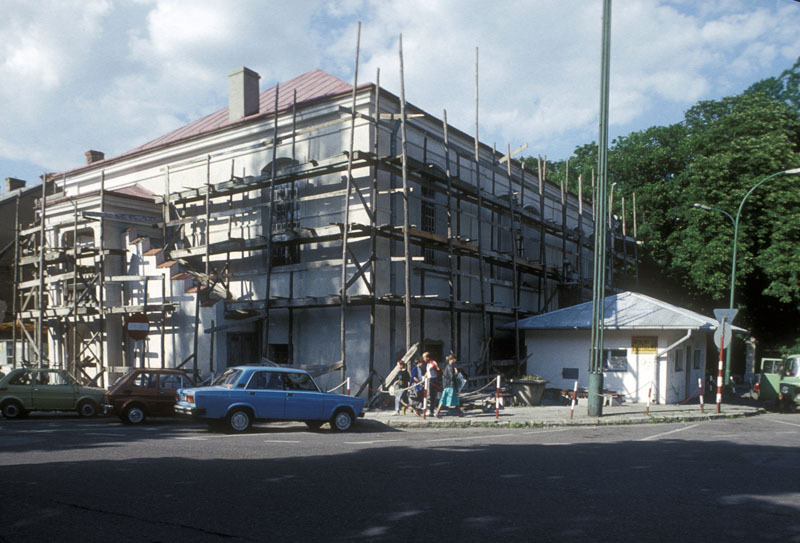 After the liquidation of the Łańcut ghetto, the Nazis turned the synagogue into a grain storehouse, and it was used as a warehouse until 1956 when the Communist-era the Town National Council moved to demolish the building. This plan was courageously protested by Dr Władysław Balicki, who forced the council to withdraw its decision. 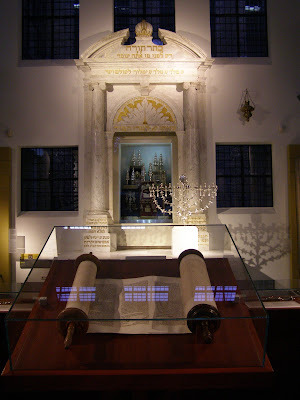 Dr Balicki, along with the head of the Cultural Department of the National Council in Rzeszów, Jan Mincal, then allocated a fairly large sum of money for the renovation of the synagogue and organized an exhibition of Judaica inside it, a rare occurrence in Poland at that time. From 1973 on the synagogue was maintained by the Łańcut Castle Museum. 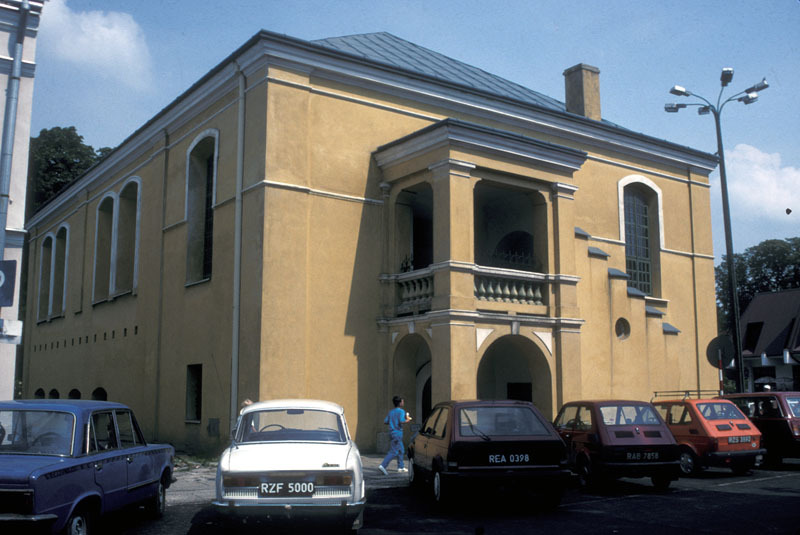 The building underwent major renovations in the 1980s and 1990s. Since 2009, it has been the property of the Foundation for the Preservation of Jewish Heritage in Poland. There are also two Jewish cemeteries in Łańcut: the old and the new. The first reference to the old cemetery, located in today’s Moniuszki St, dates back to 1671, but early all matzevot were removed and destroyed by the Germans during World War II. The cemetery is still however visited by Jews from all over the world, who pay tribute at the ohelot of Tzadik Naft ali Tzvi Horowitz of Ropczyce and Tzadik Eleazar Shapiro. The new cemetery was founded around 1860 in today’s Traugutta St. During the war, all gravestones were removed from it by the Germans. A memorial plaque commemorating the site of the execution of Łańcut Jews in 1941-44 is installed on the site. There is also a surviving mikvah at Ottona z Pilczy St, built in 1908-10. 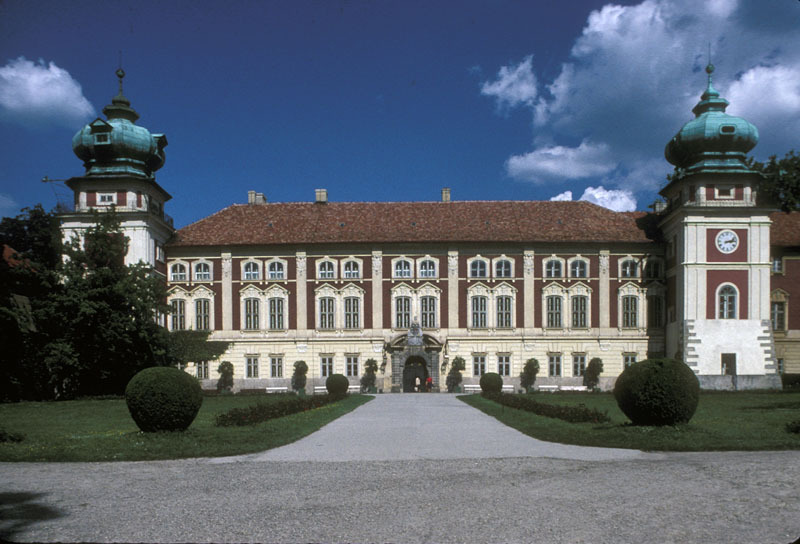 Additional information about the Jewish history of Lancut can be found in the booklet. Parur (Kerala), India. 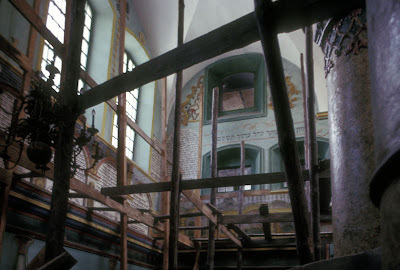 Synagogue interior. Photo: Jay Waronker. ISJM-funded researcher architect Jay Waronker has an article in the new issue of Journal of Indo-Judaic Studies on the synagogue at Parur, India. ISJM has received three grants from the Koret Foundation to support Jay's research and efforts at conservation at Parur. To order Issue number 11 send a check for $15 to Professor Braj M. Sinha, Department of Religion and Culture, University of Saskatchewan, 9 Campus Drive, Saskatoon, Sask., Canada S7N 5A5. 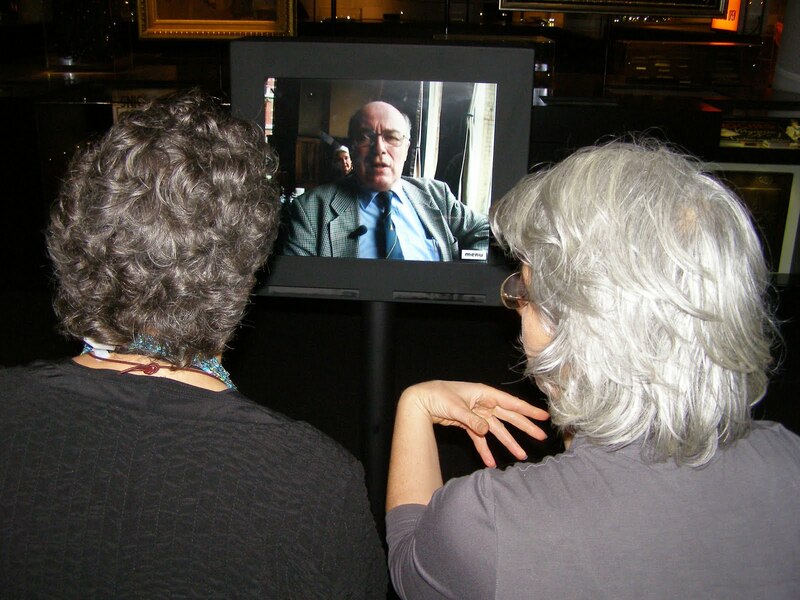 Judaica Europeana is a growing network of Jewish museums, libraries and archives which have joined to present a unified digital presences to highlight the strengths of their collections. So far twenty-three institutions in 17 cities have joined forces to provide integrated online access to Jewish collections. 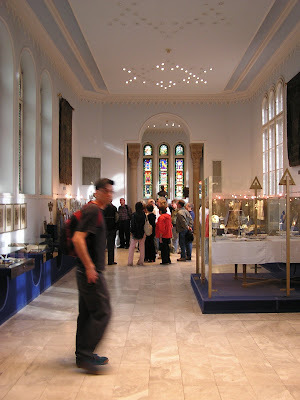 These include the Jewish museums of Amsterdam, Berlin, Frankurt and Toledo as well as London’s Ben Uri Gallery. The National Library of Israel will strengthen Judaica’s technical expertise and provide access to its collections. The Center for Jewish History in New York, which includes outstanding collections on Jewish life in Europe such as those of YIVO and Leo Baeck Institute, will complement the content held in Europe. 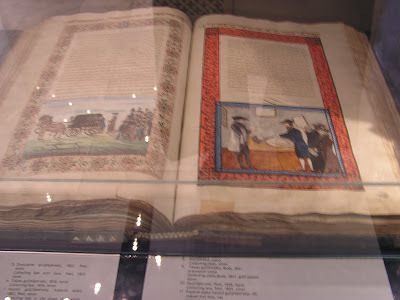 I hope I'll be able to use Judaica Europeana to getter better images than this one, which I took a few years ago without flash at the Budapest Jewish Museum. photograph: Samuel Gruber. Judaica Europeana is one of a series of initiatives supported by the European Commission’s eContentplus programme that harvest and aggregate content for EUROPEANA, Europe's museums, libraries and archives online. A prototype which features 14 million items online can be accessed on www.europeana.eu. A fully operational version will become available later in 2011. Judaica Europeana is co-funded by the European Commission under the eContentplus programme, as part of the i2010 policy. The project is just the latest in an still-evolving pan-European community of Jewish culture. In the past decade we have the slow but still struggling efforts of the Association of European Jewish Museums and also the highly popular annual Day of Jewish Culture. Judaica Europeana aims to create the most visible type of product from such international culture efforts - namely to show shared collections of Judaica to everyone, all the time, online. If successful the project will trample those last remaining cultural borders in Europe - recognizing that historically and now in contemporary terms, the Jewish people and Jewish culture are trans-national. The great strength of the site appears to be its intent and ability to house thousands of images. The weakness will be one shared with many websites - that there will be limited depth of information and analysis. For web-designers, seeing is often believing. Still, having such a big image library handy will be a boon to many. The project, however, dramatically demonstrates again the great divide that still exists in vision, organization, and technical resources between institutions in the old "West" - may of which receive state aid - and the struggling institutions in the former Soviet block. Twenty years after Communism only a few institutions such as the Prague Jewish Museum and the Jewish Historical Institute have been able to compete in competence with the old centers of London, Paris, and Berlin. A few centers, such as Budapest are also now emerging as major exhibition and research centers (on Budapest link to the JE newsletter below). Sadly, there are still many "orphaned" institutions in former "East" that most need to catalog, digitize and publish their collections. I hope that Judaica Europeana will extend a helping hand to institutions large and small. Two views form the Amsterdam Jewish Historical Museum. Video can be watch online at home, but old synagogues are best understood in the spaces, moving around, turning this way and that, and experiencing passing time and shifting light. Ah, but how many musuem goers work that hard? Photos: Samuel Gruber. According to Judaica Europeana, its strength "lies in the diversity and richness of its cross-domain offerings. Users will find at their fingertips ― only a few clicks away ― books, documents and manuscripts along with images, film and sound recordings on almost any subject. Everyone will be able to integrate this material in virtual exhibitions or in learning resources. The APIs (Application Programming Interfaces) developed by Europeana will allow the distribution of these resources directly into the workflow of the users, on PCs and mobile devices. This vast Jewish content resource will become progressively available online during 2011 and will continue to grow in the coming years." The new Judaica Europeana illustrated newsletter is out and presents highlights from the collections of Frankfurt University and the Jewish Historical Museum, Amsterdam, two virtual exhibits from Budapest and Athens and some papers given at the EAJS Congress in Ravenna. It can be viewed here.